Tuesday September 20th 1892 We washed this forenoon and began to make grape jelly. I was working in the fruit all day. The girls were over in the afternoon and Emma Weldy called. Wednesday September 21st 1892 Will delivered eight hogs this morning that brought him $163.00. I got through with the work so I was ready to go down to Aunt Libs by ten oclock. Will drove over town for me and I went down for Hattie. We had a splendid visit and a nice ride home. I helped with the evening work. Will had been making arrangements about his threshing. 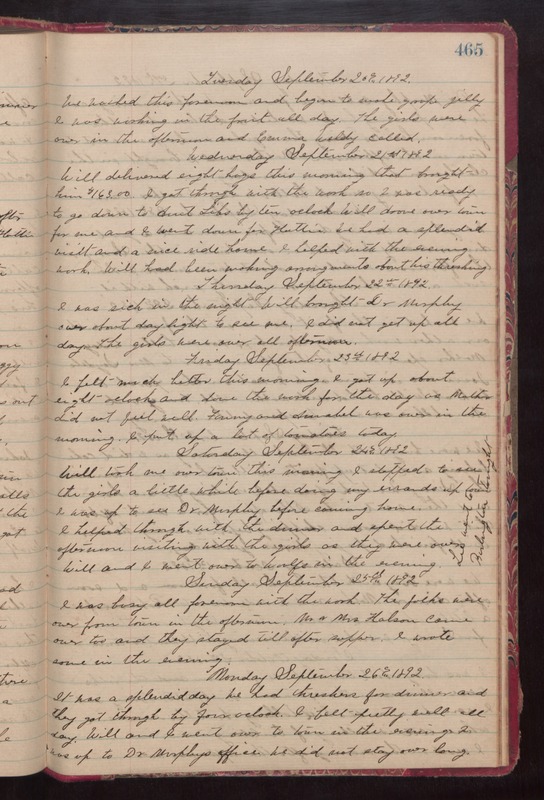 Thursday September 22nd 1892 I was sick in the night. Will brought Dr Murphy over about day light to see me. I did not get up all day. The girls were over all afternoon. Friday September 23rd 1892 I felt much better this morning. I got up about eight oclock and done the work for the day as Mother did not feel well. Fanny and Annabel was over in the morning. I put up a lot of tomatoes today. Saturday September 24th 1892 Will took me over town this morning. I stopped to see the girls a little while before doing my errands up town. I was up to see Dr Murphy before coming home. I helped through with the dinner and spent the afternoon visiting with the girls as they were over. Will and I went over to Woolfs in the evening. Lee went to Burlington tonight. Sunday September 25th 1892 I was busy all forenoon with the work. The folks were over from town in the afternoon. Mr & Mrs Halson came over too and they stayed till after supper. I wrote some in the evening. Monday September 26th 1892 It was a splendid day. We had threshers for dinner and they got through by four oclock. I felt pretty well all day. Will and I went over to town in the evening. I was up to Dr Murphys office. We did not stay over long.